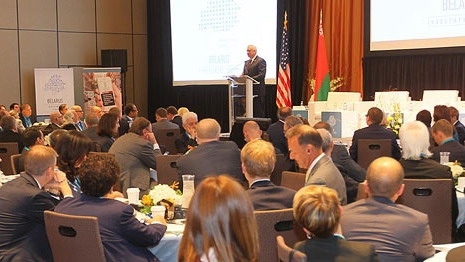 Belarus - USA investment forum in New York | MTZ Equipment Ltd. The first “Belarus - USA investment forum” was held at Grand Hyatt New York on September 22, 2014, where we were invited to participate by the Belarus Embassy in Washington. As was published in advance, many of the top Belarus government officials flew to NY to participate at the forum. MTZ Equipment Ltd. hosted a dinner in honor of the Belarus delegation. Belarus government officials have reiterated once again their support of the company and desire to provide all help possible to ensure successful sales of MTZ tractors in USA / Canada. At the forum, we gave interviews to several Belarus TV channels, which were broadcasted on National Belarus TV (a video report from the event is available, in Russian, at http://belarus24.by/news/belorussko-amerikanskij-investicionnyj-forum-v-...). Some photos from the dinner and the forum.